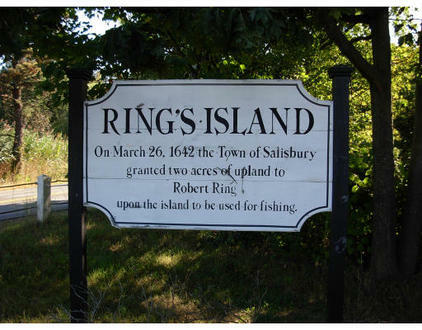 Robert RING (1614 – 1691) was Alex’s 10th Great Grandfather; one of 1,024 in this generation of the Shaw line. Robert Ring was born in 1614 in Marlborough, Wiltshire, England. His parents were Richard RING and Elizabeth SHROPSHIRE. He sailed on The Confidence from Southampton April 11, 1638 or April 24, with Master John Gibson, and 84 passengers. He was a servant of John Sanders bound for Salisbury, Mass. He returned to England about 1643 and married Elizabeth JARVIS there before 1649. He came back about 1650 and lost some rights thereby in the town. Robert died 31 Mar 1691 in Salisbury, Essex, Mass. Elizabeth Jarvis was born in 1618 in Marlborough, Wiltshire, England. Elizabeth died 23 Jan 1736 in Salisbury, Essex, Mass. c. 1690 3 DEC 1705 Amesbury, Mass. ROBERT RING(+) [or RINGE], of Salisbury, “cooper” and “planter,” prob. b. ab. 1614; per. bro. of (1)RICHARD; m. Elizabeth (???). He received land in the “first division” and in 1640; free. Oct., 1640; carried on the fishing business on Ring’s Island in 1642;?? “householder” in S. in 1677; signed petition of 1680; d. 1690; will Jan. 23, 1687-8; March 31, 1691. 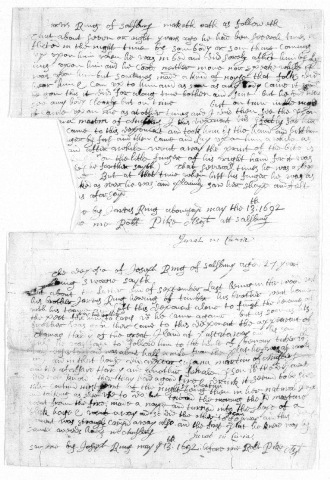 Among the deeds at Salem is a document, dated Oct. 22, 1668, which states that Richard Ring of Marlborough, Wilts, Old Eng., and his children, namely, Joseph Ring, Isaac Ring, his sons; and Elizabeth Shropshire, wid., and Hester Ring, his daus., claimed debts due them in New England; and Joseph Ring, the bearer, was to travel thither for himself, his father, bro. and sisters. JOHN ROLFE willed them property in 1664. (*) Rev. Chr. Wordsworth writes that he finds only this entry about Richard Ring on the register of St. Peter’s. 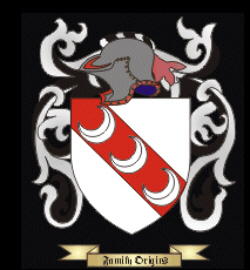 In it he gave property to “Will Cottle, son to Sarah, now wife of John Hale of Nb., and Joanna, dau. to said Sarah;” also to Rev. Thomas Wells and his son Titus; in addition to his children and grandchildren, named as such. as a servant for John and Sarah Sanders, who has been identified as Robert Ring from Marlborough, Wiltshire, bound for Salisbury. Ref: Hoyt Families Salis. 297. “Topographical Dictionary of 2885 English Emigrants to New England 1620 – 1650” by Charles Edwards Banks, Edited and Indexed by Elijah Ellsworth Brownell, Southern Book Company, Baltimore, 1957 (Lady Anne’s Library) pg. 179). So the “Confidence” seems a more likely ship for Ring’s passage than the Bevis, but it’s hardly ironclad. The Confidence left Southampton April 11, 1638 or April 24, with Master John Gibson, and 84 passengers Other sources say the master was John Jobson, arriving in Boston from Southampton April 24, 1638. The April 1638 date would be roughly appropriate for Ring becoming a freeman in Oct. 1640. Elizabeth’s husband Nathaniel Griffin was born c. 1646 Ipswich, Mass. His parents were Humphrey GRIFFIN and Elizabeth ANDREWS. 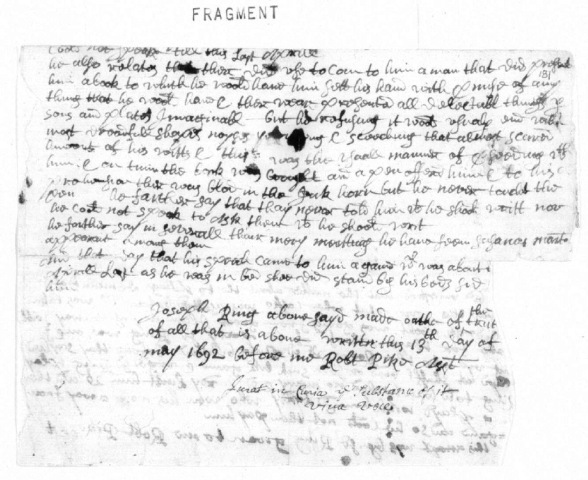 Nathaniel died in Salisbury, Essex, Mass..
freeman 1690; witness Susanna MARTIN trial, 1692. Susannah was executed for witchcraft on 19 Jul 1692 in Salem, Essex, Mass. Jarvis and Hannah Ring signed the petition in favor of Mary Perkins Bradbury [Daughter of John PERKINS] in 1692. Over a hundred of her neighbors and townspeople testified on her behalf, but to no avail and she was found guilty of practicing magic and sentenced to be executed. Through the ongoing efforts of her friends, her execution was delayed. After the witch debacle had passed, she was released. By some accounts she was allowed to escape. Others claim she bribed her jailer. Another account claims that her husband bribed the jailer and took her away to Maine in a horse and cart. They returned to Massachusetts after the witch hysteria had died down. Feb. 24, 1735-6; Dec. 26, 1743. Jarvis Ring of Salisbury maketh oath as followeth, That about seven or eight years ago he had been several times afflicted in the night time by somebody or something coming up upon him when he was in bed and did sorely afflict by laying upon him and he could neither move nor speak while it was upon him, but sometimes made a kind of noise that folks did hear him and come up to him and as soon as anybody came, it would be gone. This it did for a long time before and since but he did never see anybody clearly, but one time in the night it came upon me as at othr times and I did then see the person of Susanna Martin of Amesbury. This deponent did perfectly see her and she came to this deponent and took him by the hand and bit him by the finger by force and then came and lay upon him awhile as formerly, and after a while went away. The print of the bite is yet to be seen on the little finger of his right hand for it was hard to heal (he further saith). That several times he was alseep when it came, but at that time when bit his finger he was as fairly awake as ever he was and plainly saw her shape and felt her tooth as aforesaid. John’s wife Priscilla Norton was born 16 Dec 1667 in Salisbury, Essex, Mass. Her parents were Joseph Norton and Susanna Getchell. Priscilla died in 1721. 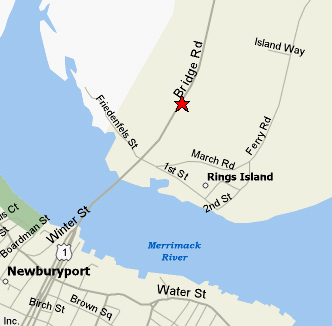 Joseph was at the taking of Casco Bay Fort; witness in the Susanna MARTIN witch trial, 1692; adm. est. gr. bro. Jarvis, May 30, 1705. Joseph Ring of Salisbury aged 27 years having been strangely handled for the space of almost two years maketh this Relation upon oath as followeth, viz: That in the month of June next after Casco Bay fort was taken this deponent coming between Sandy Beach and Hampton Town met with Thomas Hardy of Great Island and a company of several other creatures with him which said Hardy demanded of this deponent two shillings and with that dreadful noise and hideous shapes of these creatures and fireball, this deponent was almost frightened out of his wits and in about a half an hour (or indeed he could not judge of the time) they left him and he came to Hampton. About ten days after as the deponent came from Boston this deponent was overtaken by a company of people on horseback who passed by him and after they were passed by him, the aforesaid Thomas Hardy turned about his horse, and ame back to this deponent with his horse in hand and desired this deponent to go to Mrs. White’s and drink with him, which being refused he turned away to the Company and they all came up together such a weth (i.e. with so many horses) that it seemed impossible to escape being trod down by them, but they went all past and then appeared no more. About October following coming from Hampton in Salisbury Pine Plain a company of horses with men and women upon them overtook this deponent and the aforesaid Hardy being one of them came to this deponent as before and demanded his 2s of him and threatened to tear him in pieces to whom this deponent made no answer, and so he and the rest went away and left this deponent. After this this deponent had divers strange appearances which did force him away with them into unknown places where he saw meetings and feastings and many strange sights, and from August last he was dumb and could not speak till this last April. He also relates that there did use to come to him a man that did present him a book to which he would have him set his hand with promise of anything that he would have and there were presented all Delectable things, persons and places imaginable, but he refusing it, would usually and with most dreadful shapes, noises and screeching that almost scared him out of his wits, and this was the usual manner of proceeding with him. And one time the book was brought and a pen offered him to his apprehension there was blood in the ink horn, but he never touched the pen. He further say that they never told him what he should write nor he could not speak to ask them what he should write. He farther in several of their merry meetings he have seen Susanna Martin appear among them. And that day that his speech came to him again which was about the end of April alst as he was in bed she did stand by his bed’s side and pinched him. Joseph Ring abovesaid made oath of the truth of all that is above written this 13th day of May 1692. Jurat in Curia the substance of it viva voce. It is to be understood that the matter about that two shillings demanded of said Ring was this, viz: That when Casco was assaulted before it was taken, Capt. Cedric Walt was going from Great Island in Patascataway with a party for their relief of which party said Ring was one and said Hardy coming up into the room where said Ring [was] before they sailed and played at shovelboard or some such like game and urged said Ring play, said Ring told him he had no money and said Hardy lent him 2s and then said Ring played with him. Said Hardy who won his money away from him again so he could not then pay him this account was by said Ring given to me. The deposition of Joseph Ring at Salisbury aged 27 years being sworn saith, That about the latter end of September last being int he wood with his brother Jarvis Ring hewing of timber, his brother went home with his team and left this deponent alone to finish the hewing of the piece for him, for his brother to carry when he came again, but as soon as his brother was gone, there came to this deponent the appearance of Thomas Hardy of the great Island at Patascataway and by some impulse he was forced to follow him to the house of ___ Tucker which was deserted and was about half a mile from the place he was at work in, and in that house did appear Susanna Martin of Amesbury and the aforesaid Hardy and another female person which the deponent did not know. There they had a good fire and drink, it seemed to be cider, there continued most part of the night, said Martin being then in her natural shape and talking as she used to do, but toward the morning the said Martin went from the fire, made a noise and turned into the shape of a black hog and went away and so did the other two persons go away and this deponent was strangely carried away also and the first place he knew was by Samuel Wood’s house in Amesbury. This entry was posted in 12th Generation, Immigrant - England, Line - Shaw, Place Names, Witch Trials and tagged Indentured Servant, The Confidence 1638. Bookmark the permalink. Hi. Just wanted to say thanks for this info. I’ve been working on tracking the Ring family and this was some great info. The Robert Ring listed is my 8th great grandfather. Anyway, thanks again. Because their son Robert was someone else? Patricia- you can contact me at rodney@ringcolorado.com I have Ring wills and records back to 1480.